We invite you to join us in worship, in prayer, and in friendship. Join us at our daily Mass and at our weekend Liturgy. Worship the Lord with us and be enriched by thoughtful homilies, beautiful music, and a welcoming community of faith. Now you can support your parish electronically. You won't need to worry about bringing envelopes or remember to bring your checkbook or cash with you to Mass. Ash Wednesday: March 6th&dash; The Masses are 9:00am & 7:00pm with distribution of ashes at the Masses. Stations will also be held on Thursdays after the 9:00am Mass, and Adoration will continue on Fridays. Note: The information session, originally scheduled for February, has been rescheduled to March 16, 2019, at 6:00pm. The Parish Health Ministry is celebrating its twentieth anniversary. In February of 1999, the first meeting of the Parish Health Ministry was held at St. John Chrysostom. A mission statement was formulated and goals were set. Since that time, the Parish Health Ministry remains true to its original mission of ..."ministering to the physical, emotional, and spiritual needs...through assessment, advocacy, referral, education, and support.? Our commitment to our mission has been fulfilled in many ways - health fairs, blood pressure screenings, parish health surveys, educational bulletin articles, and prayer shawls. We have also been involved with helping to obtain the AED (Automatic External Defibrillator), setting up the first aid kit, education programs, and organizing a drive for supplies for a women's shelter. As the parish community changes, so do the health concerns of its members. We would like to invite nurses, other health care professionals, and anyone interested in health to participate in the Parish Health Ministry. There are several ways to participate to keep everyone involved. We are interested in providing programs on health issues such as the Catholic Health Care Proxy, the opioid epidemic, and supporting care givers who are taking care of loved ones. Nurses are needed to assist with blood pressure screening once a month. Participation is flexible and is based on your availability. Blood Pressure Screening occurs on the second weekend of the month before and after the Saturday 4pm mass and after the 7:30 am Sunday mass. Please leave your name and number in the parish office. Once the Parish Health Ministry receives your name we will call you. Also feel free to drop in to room 1 on our blood pressure screening weekends to talk with one of us. Congratulations Father Paul! Sixty Years! Rev. Fr. 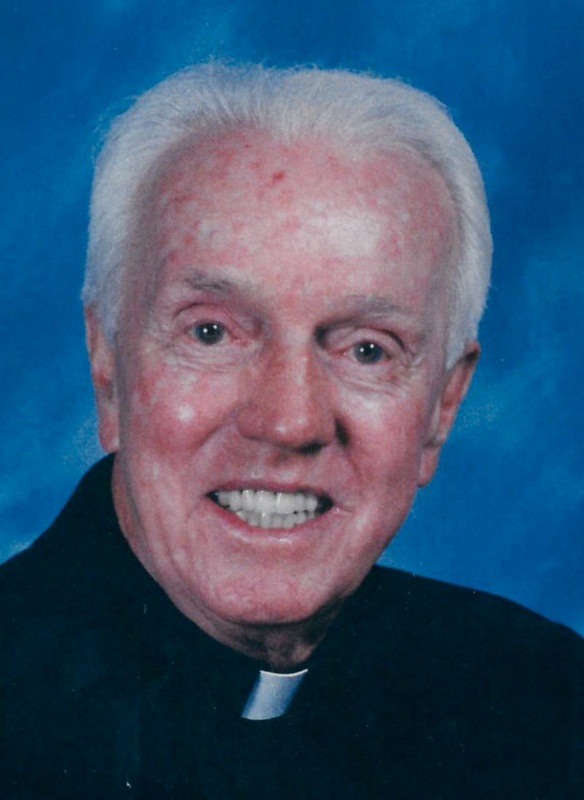 Paul V. MacDonald was honored for the Sixtieth Anniversary of his Ordination into the priesthood on Sunday, February 3, 2019. Ad multos annos! After much contemplation we have decided we will no longer be able to have our Saturday evening 7:00pm Mass. Our final Saturday 7:00pm Mass will be on January 12, 2019. The attendance has just been too low. We recognize that there are several parishioners that have regularly attend this Mass. We regret the inconvenience. Weekly Parish Bulletin: we have a new publisher that is printing our weekly parish bulletin. The innaugural issue was our Christmas bulletin. Read it here or visit our page on the Pilot Bulletins web site. Saint Vincent de Paul: In the gospels Jesus calls us to love our neighbor. Help us help our neighbors who feel beaten up by life, perhaps robbed of self-respect, and who might feel invisible to those in our community. Our next Blood Pressure Screening is scheduled for Saturday, March 9, 2019, before and after the 4:00pm Mass and on Sunday, March 10th, 2019, after the 7:30 am Mass in Room 5-6 of the Parish Center. The next meeting of the Saint John Parish Health Ministry will be held on Wednesday, March 6th, 2019, at 7pm in the Parish Library. New Members are welcome. It is not necessary that you be a nurse or health care professional to be part of our Health Care Ministry. Project Cookie Dough: Many thanks to the bakers who made homemade cookies last month - they were very much appreciated by all their recipients! This month's batches of cookies will be due on Friday, March 15, by 3:00 p.m. New bakers are always welcome. Leave cookies in the parish kitchen downstairs. If you have any questions, please feel free to call Donna O'Connor at 617-524-4396. Thank You! Take a look and take out a book. Saint Vincent de Paul Society: There are many in our community in need. Saint Vincent de Paul is an organization to help. Would you join us so that we can better identify those in need and provide them with assistance? If you can, please call or leave your name in the parish office, or leave a message at 617-469-0459. Pray for our Sick: Each day we pray for those sick or infirmed in the Parish. If you would like us to pray specifically for someone in need, please write the name of the person in the Parish Book of Intercession in the vestibule of the church or call Saint John's Office at 617-323-4410 ext. 10. Volunteering at Saint John's Saint John's is blessed with all those who volunteer their time to enrich our parish community. It reflects the generosity, the social commitment and the basic Christianity of our parish family. At present the Liturgical Committee is calling parishioners to serve in the following ministries, Eucharistic Ministers are called not only to minister the Body and Blood of Christ, but to have and maintain a strong faith, a sense of awe, and an inclusiveness of others as the foundation for their ministry. The ministers accomplish this by strengthening their faith from within and sharing it with the faithful at communion time. There are additional duties available at Saint John?s that you can participate in that will allow you to assist the parish and help you serve your faith. We need people willing to serve as Lectors or Adult Altar Servers. If you do not wish to be out in front, you may wish to care for the altar or arrange for the flowers. Whatever your expertise, your assistance would be greatly accepted. No job or amount of time is too little. If this speaks to you and you would like to be involved or just to find out more, please call or email Mary Campion. Communion Calls The parish staff will bring Holy Communion to home bound on a monthly basis. Please call the Parish Office 617-323-4410, if you know of someone who is home bound and who would like to be included. Celiac Disease For those with celiac disease, we do have low-gluten hosts. When you come up for communion the priest will have the low gluten hosts in a separate container (pix). Take the host out of the container yourself since the priest has touched the hosts that are not gluten free. Military If you know of someone on active duty or about to be deployed and would like their name displayed in the vestibule of the church, and included in the parish bulletin, please contact the parish bulletin with the name and service. We will remember them in our prayers. Peace Garden in Memory of Father Charlie On June 4, 2017, we dedicated the peace garden in Father Charlie's honor. The garden is located in the back yard if the church. It will always be open to anyone who wants to sit and reflect, have lunch or even take their coffee outside. It is our parish garden for some quiet time. Saint John Chrysostom Parish is a welcoming, inclusive community of believers in Jesus Christ. We invite all to pray with us. The gifts we bring and the joys we share are influenced by our personal history, religious experiences and orientation, all of who we are. We follow the Gospel message of love through vibrant liturgies which inspire us to act as we come with open hands serving the needs of all peoples. If you are new in the parish, please stop by and say hello to the celebrant following mass and introduce yourself. Also, visit our office in the parish center or call the parish office (617) 323-4410 EXT. 10 to register with us so we have your name and address. Anyone in our parish who will be moving is also asked to advise us of their new address. Thank you. 315676 Visitors since 11 March 2012.